At the ceremony, the minister also voiced his wish that a day will come for the two Koreas to carry out a joint project to excavate the remains of fallen troops in the Demilitarized Zone dividing the peninsula. "(We) will expand the professional staff and budget of the defense ministry's excavation team and maintain a posture to deploy them," he said. "Through such an opportunity, we will be able to solidify the path towards peace and stability on the peninsula," he added. Gen. Vincent Brooks, the commander of the US Forces Korea, called the return of the remains "our solemn obligation." "We are gathered here to fulfill our solemn obligation to never forget those who have fallen in battle and those who have been listed as missing in action or prisoners of war," he said at the event. "Our solemn obligation to remember is the least of our responsibilities. The greater responsibility is to account for every one of them and return them to their families ... May this be the journey of all who remain missing in action or listed as a prisoner," he added. Kelly K. McKeague, the director of the Defense POW (Prisoners of War)/MIA (Missing in Action) Accounting Agency, was also at the event. 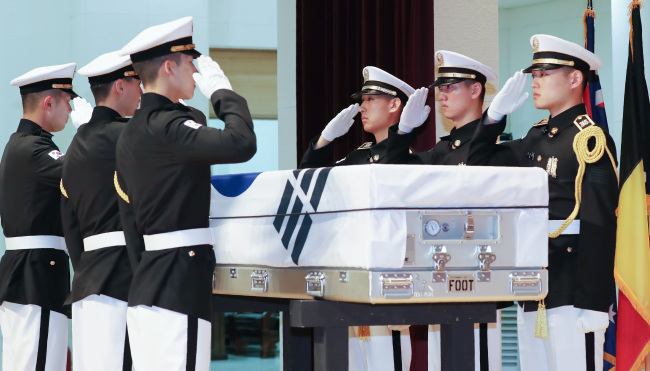 "It is my fondest hope that the ceremony is able to bring solace to the Yoon family for their loved one's sacrifice in keeping their country free and results in the identification of another missing US service member," he said. "The fact that the Republic Of Korea and the US are staunchly committed to find, recover, repatriate and honor those who sacrificed their lives in defense of liberty is a strong testament of our nations' shared values," he added. Yun is presumed to have died on Nov. 28, 1950, while retreating following the Chinese military's entrance into the war after the successful Incheon landing operation overseen by Gen. Douglas MacArthur, then-commander of the US-led UN forces. Yun was part of the Korean Augmentation Troops to the US Army, better known as KATUSA. His remains were found among the other remains excavated in the North's South Pyongan Province in 2001 during a joint retrieval project by the US and the North. Through the 1996-2005 project with the communist state, Washington found many sets of remains, which were sent to the US Defense POW/MIA Accounting Agency in Hawaii for forensic identification, according to Seoul officials. Under a Seoul-Washington arrangement for bilateral cooperation on the excavation of remains, the US sent a DNA sample of Yun's remains early this year to a defense ministry agency in Seoul, which later confirmed the remains as Yun's. The allies are currently trying to identify some 180 sets of Asian troops' remains, some of which are expected to be those of South Korean troops killed in action. The remains of the unidentified American soldier were found in Cheolwon in Gangwon Province, 80 kilometers north of Seoul, by Seoul's excavation team in June 2016.